Spring Flowers is done! And I LOVE it!!!!!! 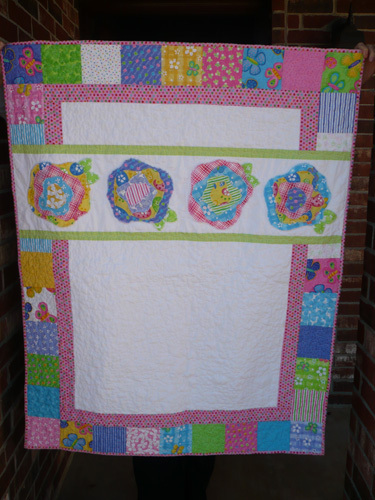 For starters I used Camille’s Baby Mine pattern. 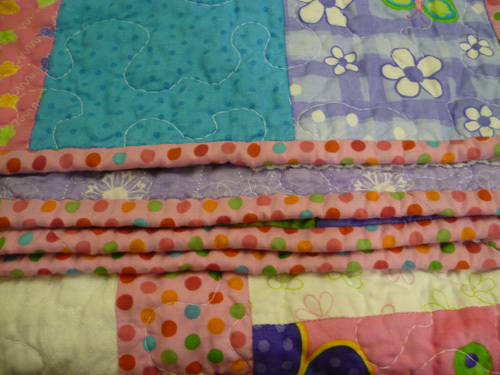 The pattern is a great deal because you get 2 patterns for the price of 1–a girl quilt and a boy quilt. 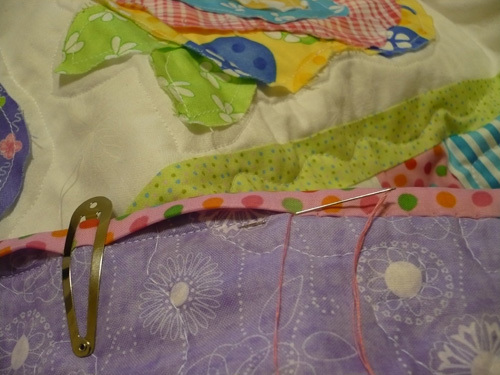 I wasn’t 100% sold on the flower applique pieces that go with the girl quilt. So I hunted through my library of patterns and found one that I love…it’s called French Roses by Heather French. Some day I’m going to make an entire quilt of French Roses (I even have the fabric for it), but since that’s down the road I figured I give the French Roses a whirl by substituting these flowers for the ones that came with the Baby Mine pattern. 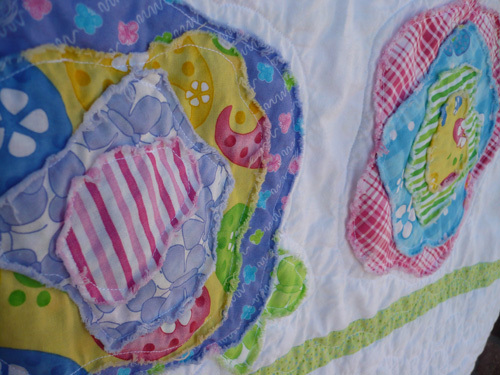 The French Roses pattern uses the soft edge applique technique, which I thought is perfect for a baby girl’s quilt. I’m certainly in love with soft edge applique! I’m so glad I made this modification. I think the French Roses flowers are softer, more feminine, and just downright adorable. 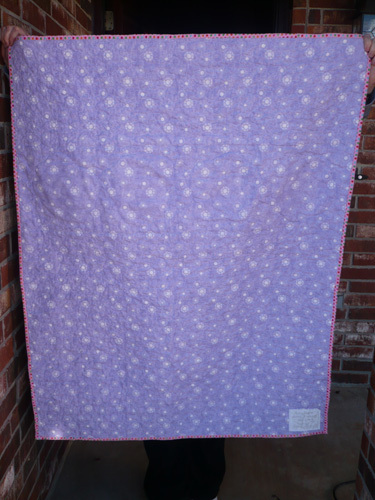 The quilt measured 40 x 50 prior to washing and measures 37 1/2 x 47 1/2 after washing…perfect size for a baby. Fabric: Butterfly Fling by Me & My Sisters Design for Moda, the white is a white on white design with butterflies, the polka dots and some of the fabrics in the flowers are from my stash. 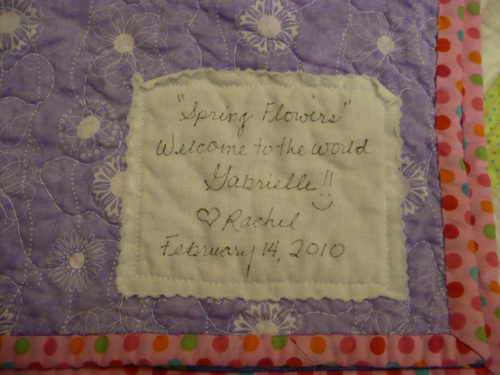 I haven’t posted much about the Spring Flowers quilt, but it’s now pieced, quilted, and bound. I had a date with the quilt tonight to finish the binding, and I had success! It’s such a great feeling to finish the binding! I still have to bury all the threads, then label it, then wash it, and then I can send it to its new home. 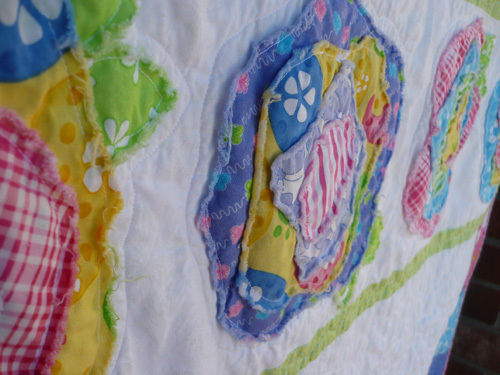 The colors in this quilt certainly remind me of spring, and I can’t wait for the new mama to open up this quilt for her baby girl! When I finish this quilt up I’ll post about the changes I made to the pattern.